If you've been reading my blog for a while, you probably know that I have some unexplained health issues. I have been having problems with my fingers since about 6 months after Katrina was born (she is now 6 years old). I've been to my doctor as well as a Rheumatologist and a Naturopathic Doctor and have had numerous tests done by my family doctor, specialists, and others. Unfortunately, through all of that, we have been unable to come to a conclusion about what is wrong with me. We have some clues, but nothing conclusive and the consensus seems to be that we won't really know what the problem is until it gets worse. That sounds comforting, doesn't it? My hands seem to go through periods of time where they feel just about normal, and then they go through flare-ups when they get worse. Sometimes during these flare-ups they are in so much pain that I can't put my own hair in a pony tail or hold my cereal spoon without pain. Always, using my heavy camera causes pain (one reason why I am so grateful to have my new, lighter DSLR!) and this is so frustrating because some of the things that I love to do are causing me pain- and sometimes, everyday activities are painful! I have tried a couple of prescription pain medications and other over-the-counter solutions (none of which have been solutions for me). The prescription medications come with pretty serious risks and possible side effects, so they are not worth using when I can't really perceive any difference in my pain level. In October, Jenni contacted me after reading my blog and told me about her business that she does from home, teaching people about natural healthcare and doTERRA essential oils. She asked if I would be interested in trying them and reviewing them on my blog. I had not tried using essential oils very many times before (the only specific times I could remember using them were once when I made some DIY bath salts and used some cheap essential oils (from the dollar store) to scent them and once when my sister-in-law visited, she had me try one of doTERRA's oil blends called deep blue for my hands (but again, I didn't notice a difference- granted I only tried it once, and it wasn't really a "bad pain day"). Before I get into my experience with each of the oils, I just want to say that working with Jenni was so great! If you're going to use doTERRA essential oils, you can order through any of their Wellness Advocates, but having worked with Jenni, I can very comfortably recommend her to you! She was always available to me whenever I had any questions and was very willing to help me to figure out what oils I could try for different issues. She also came up with a custom blend for my hands that has been amazing (and I will get into that more in this post after telling you about some of the other products we tried). This oil blend is good for headaches and neck tension and other pain. I thought I would try this on my hands if the custom-blend Jenni sent me didn't work (but I never had to! More on that later in this post). I tried this one a few times for headache- it's really nice because the instructions say to, "apply to your forehead, temples, and back of neck as a massage for stressful tension and discomfort. After application, recline in a comfortable position with eyes closed and breathe in aroma deeply." I loved doing that when I could! It is so nice to just take some time out to give yourself the rest and treatment you need when you're in pain! I found, however, that I didn't use this every time I had a headache or tension because I usually felt like I needed to just keep going with my day and when I needed relief, I was more likely to reach for a pain pill and then just continue on with my day, hoping it would work. 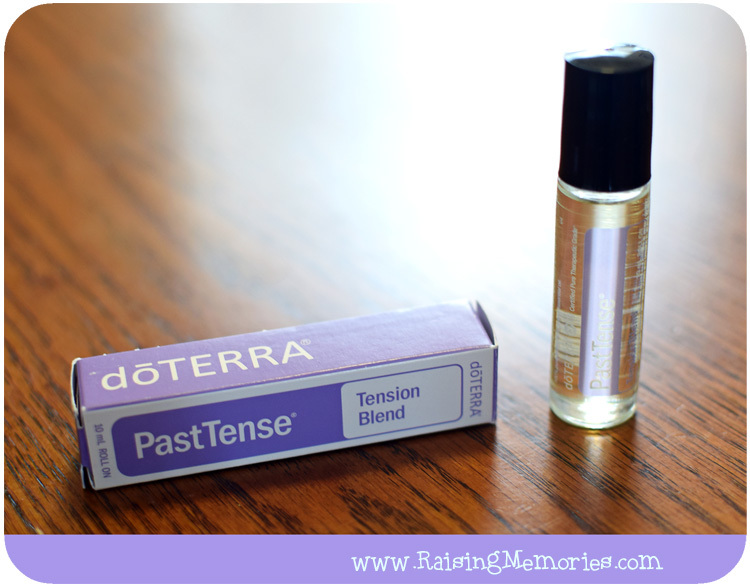 I have given PastTense a try for just tension, too- this week my shoulders and neck have been SO tense! I actually looked up a youtube video with shoulder stretches and did that, then I took some time out to have a bath with a few drops of Lavender oil in it and then rested with some PastTense rubbed into my temples and I felt like I had been to a spa! This toothpaste is flouride-free and has a bunch of great natural ingredients that help strengthen teeth, reduce plaque, polish, and whiten teeth. I LOVED this toothpaste! I like the taste of it and I love the way my mouth feels after I use it and how smooth and clean my teeth feel. My husband really liked it too (and noted that he could really taste the clove oil in it). It also has wild orange, cinnamon, eucalyptus and rosemary oils which add to the taste and to freshen breath. Reading the rest of the ingredients, I was impressed that this also includes myrrh, peppermint and a bunch of other great ingredients. This toothpaste is also safe for the whole family. The only downside to this toothpaste for me is that I have ridiculously sensitive teeth and after a few days of using it exclusively, my sensitivity kicked right back in and I had to switch back to Sensodyne. 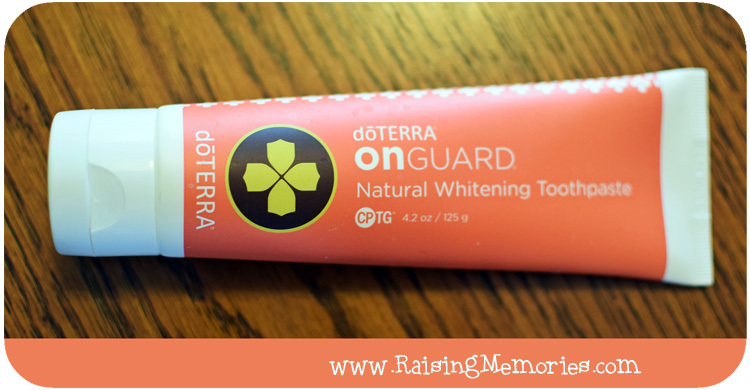 That was such a bummer for me because I truly enjoyed using the doTERRA toothpaste! I'm not giving up on it though, I'm just going to alternate between it and Sensodyne, to keep my sensitivity in check! 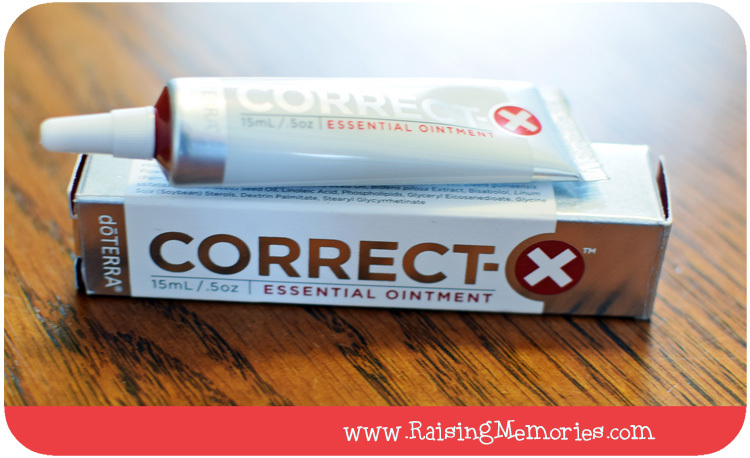 This ointment is to be used for soothing skin irritations. We used it just like an antibacterial ointment for cuts. I loved using it for that purpose and found that it worked great. I also tried using it on my lips when they got very dry! Now I have to talk about the custom blend of oils that Jenni sent me to try on my hands. My expectation was that the oil would probably feel kind of nice, maybe smell good and be fairly pleasant to rub on my hands. I was NOT expecting any real healing or relief beyond the initial application. I tried putting it on one day after I received it when my hands weren't bothering me too much and sure enough, it felt good to put on: it felt kind of warm at first, and then cool. It had a strong scent (which I liked) and was generally pleasant. I didn't think much about it for several days after that until one day one of my thumbs was really bothering me. Finally I thought of the oil blend and thought "why not, I'll put some of that on." A few minutes later, I noticed that my thumb wasn't hurting anymore! I questioned whether it was a coincidence. Something similar happened a few nights later and again I was surprised- and trying every finger position I could think of to try and feel the pain again, but couldn't. I was confused because I really wasn't expecting this to be some sort of miracle solution- I guess I just didn't believe that essential oils could make that much of a difference. I had quite a few days with minimal hand pain and didn't think about the oil blend again until my hands started really hurting bad one day (I mentioned it in a blog post here). The pain was really bad and kept stopping me from doing things. I was so frustrated that I wanted to cry! Then I remembered the oil blend and figured it couldn't hurt, so I rolled it over my fingers and hands and rubbed it in and just sat for a while. What the heck, you guys, the pain went away!! That's when I really started paying attention to it and ever since then, I have been going back to it every time my hands start to flare up again. I am amazed that these oils can work for my hands and so excited to have found something that actually gives me relief! I am also SO thankful to Jenni for listening to my explanation of the pain in my hands, what I know about it, what I don't know about it and what I have already tried. I'm so impressed that she was able to put together a blend that worked for me! Lemon can be used internally to soothe a cough or sore throat or to flavour water and can also be used to remove gum, label adhesives, and greasy substances from fabric- I need to try that! There are a ton of other uses but I just wanted to name a few. Peppermint can calm indigestion or upset stomach. It can also be used with lavender on sore, tired muscles and joints. It is also a kind of invigorating scent that you can inhale as a non-stimulant pick-me-up on long drives or to keep you alert (or your kids alert- one suggestion was to put it on a child's shirt before study time for alertness!). These 3 oils come together in an introductory kit with lots of suggestions for use, more information about doTERRA essential oils, and a disc with more information on it. AND one of you will win your own introductory kit! the rafflecopter form below the video! Disclosure: I received product and compensation in exchange for this review. All opinions and experiences shared in this post are my own and completely honest (as usual)! I really like peppermint, we use it almost every day! Wild Orange and Lemongrass are always in my diffuser. 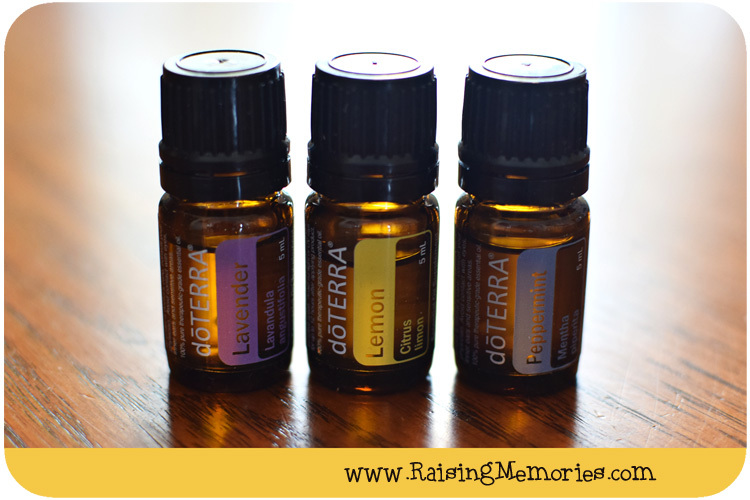 I recently got into Doterra too! My DH has trouble sleeping and we started trying oils to help him! I love them so much!! They work so well! I think I'm going to try some lavender when I'm ready to go to sleep, after hearing several comments about using oils for sleep! I really love the essential oils. I was introduced to them by a co-worker about a year ago and have been using them ever since. They work fantastic on headaches and I make my own rubs at home with them all the time! Thanks for sharing the giveaway! That's so cool to hear. It's amazing how many people I keep hearing of who have both tried essential oils AND been happy with the results. Thanks for sharing a bit about your experience! I'm sorry for what you are going through with your hands. :( I'm so glad you find the essential oil blend helpful. I would sure like to try the tension blend. My neck is constantly giving me trouble and it tends to spread to my head. Plus, the shoulder tension caused by sitting at the computer each day is not fun! I have been hearing more and more about doTerra. I liked reading your experience with them. This is something I would be interested in trying too. Thanks for sharing! You're very welcome- I'm glad my experience can be helpful- it really is interesting to learn more about essential oils! I have been reading more and more about oils and wondering if that would help a couple problems I have with sinus and anxiety. I love reading experiences on how well they are working. You should give them a try! I wish I had known about this blend that worked for me sooner! I also have finger problems lol... But they are called chalblains. I would love to see if this could work on my hands too. It is so nice to find something that works after essentially giving up on hope that anything would! I hope you find your solution! Hi Aimee, I only use a carrier oil if I am rubbing oils on my baby's chest, back, or stomach. If I put oils on their I feet I don't use a carrier oil. I put my carrier oil, I use fractionated coconut, in a big roller bottle that I found online. What I do is roll the carrier oil over the area I am going to put oils on. I put it on first then I add the oil I am using and message it in. You can mix the essential oil with the carrier oil and apply them together it will work the same. I hope that helps! absolutely love essential oils. I use them for all kinds of things..Healing, aromatherapy and spiritual healing. Awesome giveaway thanks for the opportunity Muah! 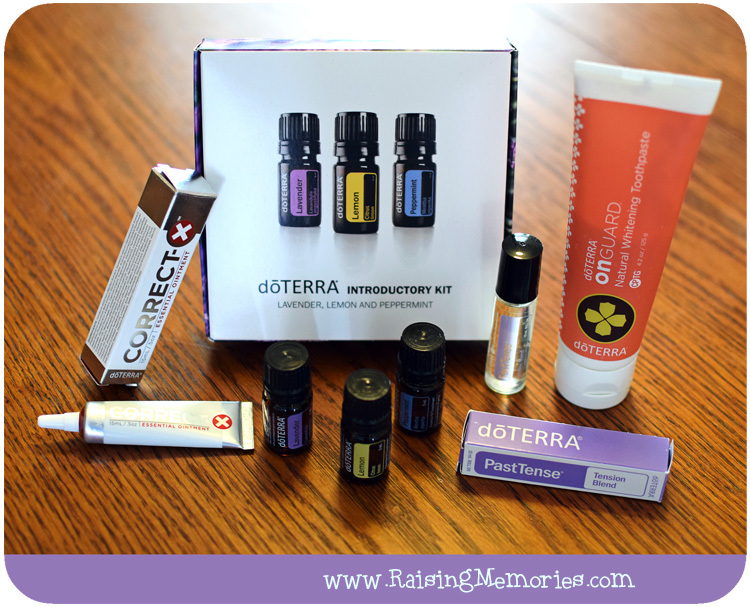 I'm a huge doTERRA fan! I've been using the essential oils and other products for almost a year now. Even my 6 yr old drinks her water with either lemon or wild orange every day! Wow, this is so amazing!!! I like Peppermint Oil. Peppermint Oil is best. Not sure if my first post went through, so feel free to delete if this is a duplicate. Do you happen to know the proportions (how many drops) of each oil and FCO she used? My husband gets hand pain and Deep Blue is not helping enough.